Does a Baked Potato Cook Faster if You Poke Holes in It? Do Frozen Potatoes Cook Well Once They're Defrosted? Baked potatoes can be cut in a few different ways. 1 Does a Baked Potato Cook Faster if You Poke Holes in It? 2 Do Frozen Potatoes Cook Well Once They're Defrosted? Potatoes have been a staple of the human diet for more than 7,000 years. First discovered in modern-day Colombia, the rough and durable nature of the potato has allowed it to thrive over time. Eaten all over the world, potatoes are cooked, boiled, fried and baked for a starchy treat. 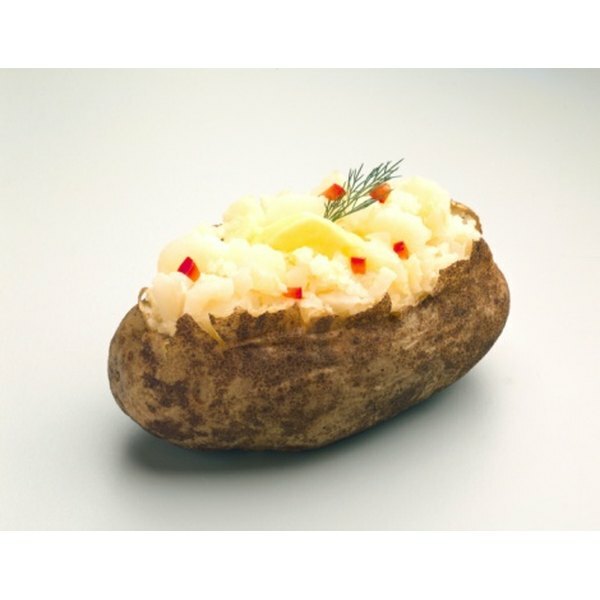 Baked potatoes typically are rolled onto their flattest side, poked with a fork and then cooked in an oven for at least 45 minutes, depending on the oven and its temperature. Baked potatoes are typically cut in one of a few ways for enjoyment. Cook the potato to your specifications. What's Cooking America recommends that potatoes be baked for 45 minutes at 400 degrees Fahrenheit, with a few holes poked in them so they do not explode. Remove the potatoes from the oven and place on a plate. Slice a cross into the very center of the potato. Push the outsides of the potato together just a little bit so that the potato opens. Add cheese, bacon, sour cream and anything else you'd like. Cook your potato to your specifications and remove it from the oven. Cut a thin layer off of the top of the potato in the middle, starting about an inch from either side. Push the ends of the potato together so that the insides plump up a little bit. Cut uncooked potato lengthwise into wedges. If the wedges are too large, you can further cut them in half. Place extras on potatoes as desired. Place potatoes into preheated oven at 425 degrees Fahrenheit for 30 to 45 minutes. Let cool for five minutes and serve. How Long & What Temp for a Large Baked Potato? Do Potatoes Cook Faster if You Poke Them With a Fork? How Long Do You Roast Potatoes & at What Temp?